If you’re not actively collecting leads, your marketing outreach is falling on deaf ears. Why are leads so important, how can you start collecting them, and what info do you need to collect? Keep reading for the answers to these questions and more. 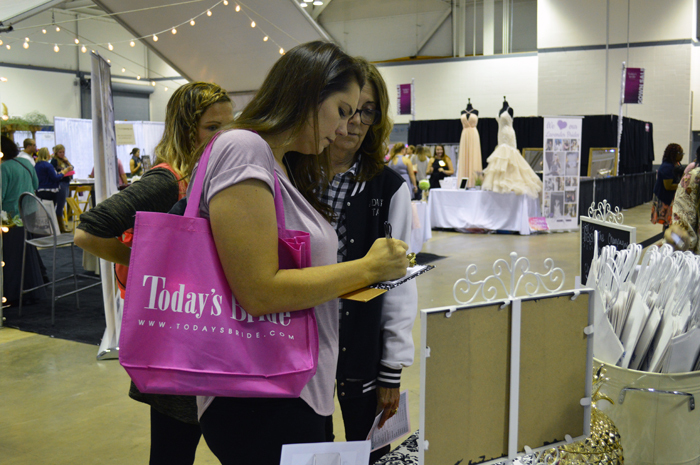 These brides are seeing the names of hundreds of companies as they plan their wedding. Searching online, flipping through pages of magazines, referrals from friends, bridal shows, wedding websites…how can they possibly keep track? Even if they’ve met with you in person, that doesn’t ensure that they’ll remember you. They may have scheduled 6 appointments in the one weekend they happened to have free and can’t remember which company they loved and which one they couldn’t leave fast enough. That’s why it’s so important for you to make the first move and contact them. Remind them who you are, how you met, what services you provide, and any basic details they may need to know. If you had a one-on-one appointment, it’s always courteous to send a thank you note. It will set you apart from your competition, get your name in front of them, and let them know that you truly appreciate their business and interest. You should always have a way for interested clients to contact you easily viewable on your website. Whether you have your phone number and email located on every page, include a contact page, or provide an inquiry form, brides shouldn’t have to look very hard if they want to contact you. Keep track of every email that comes in via a CRM database or Google Sheet. That way, when you go to send out a mass email, you can simply import a document rather than manually type each individual email address. Your contact form MUST INCLUDE details like: name, wedding date, email address, phone number (don’t make this field required! A lot of millennials avoid phone calls and would rather leave your site and find a different vendor than put down their phone number. If you require a phone number, you’re losing prospects!). You can also add questions about their wedding like: What’s the style of your wedding? Where are you getting married? What price range are you looking to stay in? What’s the level of formality? These will allow you to have an understanding of their expectations and build an email response catered to them. 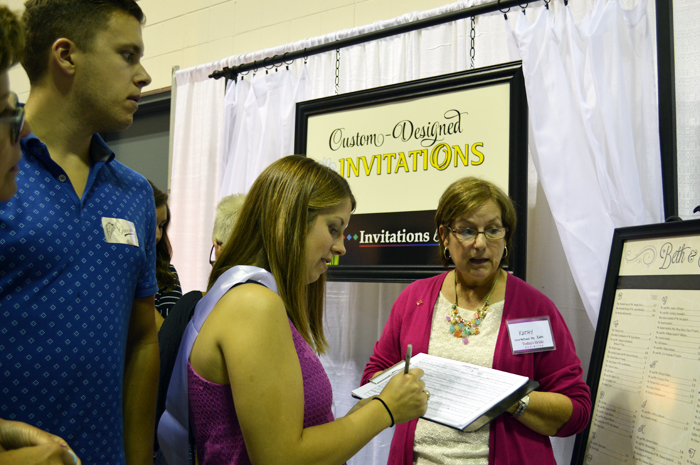 If a bride signs up to receive more information from you at your booth, her interest level is higher than a bride who stumbled upon your website. She is a hot lead, and you have a better shot at getting her to sign a contract. If you’re having a great conversation with a couple at a bridal show, hand them a tablet or laptop and ask them to enter their information to receive more information about pricing and date availability. This form can be on your website or via an app or document. Just be sure you double check the facilities wifi arrangement before relying on internet use. If you’re not a huge fan of using technology, you can always go back to the trusty pen-and-paper tactic. Create a form where couples can write down their information. At Today’s Bride Shows, we actually instruct brides to bring along address labels that have their name, wedding date, address, and email on them so they can pass them out to vendors they love. On the back, write a quick note about them so you can recall exactly who they are when you go back to write a follow-up email. 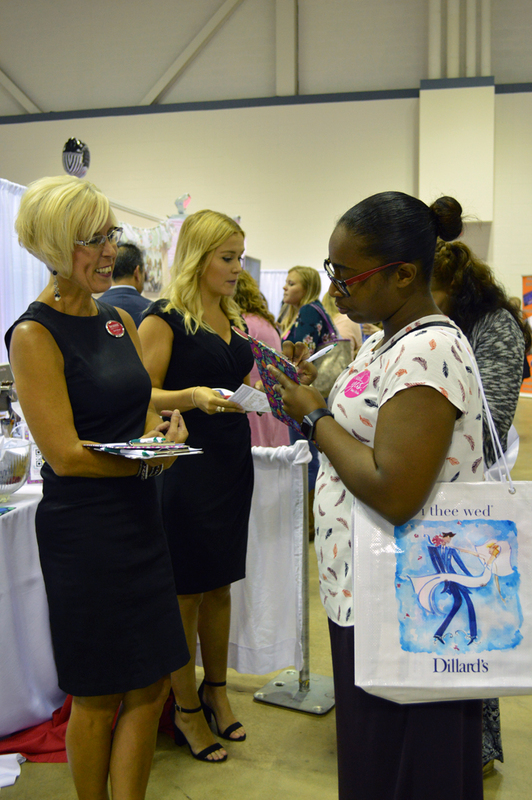 Interested in exhibiting in a bridal show? We can help with that! You may think print ads don’t work, but in reality, you just don’t realize how many of your leads have seen you in a magazine! Think about it: if a bride is looking through a magazine, is she immediately going to call you, or will she visit your website first for more information? She’ll visit your website, and if she likes what she sees, then she’ll contact you. It may seem like that lead came from your website or from a Google search, but really, it’s from a print ad. Read more about why print advertising works! The important key to tracking these leads is to include a differentiator in your ad. For example, feature a special deal that is only available for brides who mention your ad. Or, create a special link that redirects to your website and track how many people use it from Google Analytics. Again, these organic leads are hotter than the lead list you may get from the magazine publisher, as they’ve clearly shown enough interest in your business to look into you further. When contacting them to follow up personalize these emails so they don’t look like mass mailings by adding their first name. Want to see what a bridal magazine is all about? View ours online! Once you get a lead, it’s so important to follow up. If a bride contacted you first, always contact her in the same manner. For instance, if she sent you an email, respond via email. Likewise, if she called you, she expects a phone call in response, not an email. If you require both an email address and phone number on your contact form, it’s courteous to ask which method of contact they prefer. Regardless of your contact methods, it’s always a good idea to follow up every phone or face-to-face conversation with a recap email. When trying to sell any millennial, your conversation should be focused on them, not you. While your contact form should only include basic information like name, email, wedding date, and phone number, you should take notes on details about them via your conversations. Ask questions like “What’s your vision?”, “How formal do you want your wedding to be?”, “Do you expect it to be an intimate gathering or large celebration?”, “Do you have a theme or color scheme?” This will allow them to feel like you’re interested in them, while giving you useful information. From this, you can gather how much they’re willing to spend (based on formality and guest count), season, and style. Knowing all of these details will help you understand their vision, which will make them feel heard and understood. It’s important to build a relationship with prospective customers, so ask questions about them to get them talking! People love talking about themselves, so ask questions like “How did you meet?”, “How did he/she propose?”, “Do you have any pets?”, “What’s your favorite movie?”, “Do you have any hobbies?” These questions don’t have to be wedding related – they’re just great to get the client customer with sharing their stories, ideas, and opinions with you. Knowing which brides are “hot leads” and collecting their information is your first step to making the sale. From there, it’s all about the follow-up. Don’t rely on a bride to reach out to you – she might not remember your name among the dozens of others! Collect her information, and stand out among your competition by reaching out to her, first.